Through eight innings, Class A Lakewood had put just one hit on the board against Lexington pitching in the opener of the South Atlantic League's best-of-5 Finals. Then the BlueClaws' bats came to life in the ninth. Rodolfo Duran, Jhailyn Ortiz and Nick Maton belted belted back-to-back-to-back homers to erase a five-run deficit, and Madison Stokes singled in the go-ahead run in the 11th frame en route to a 6-5 Game 1 victory over the Legends at Whitaker Bank Ballpark. The BlueClaws found tough sledding against Legends starter Yefri Del Rosario, the No. 24 Royals prospect, who allowed just one single through six scoreless innings. The same held true against 27th-ranked Janser Lara in the seventh and Daniel Duarte in the eighth. With only one offensive chance remaining, the visitors started clicking. Trailing heading into the ninth, 5-0, pinch-hitter Josh Stephen dropped a leadoff single into center off Duarte. Jake Scheiner followed with a single to right, setting the stage for Duran to start Lakewood's power surge. The catcher muscled a three-run blast to left-center to get his team on the board. Ortiz, Philadelphia's seventh-ranked prospect, then connected on a long ball to right to draw the BlueClaws to within a run. "We've been doing this all year," Phillies No. 29 prospect Nick Maton said. "Never once have we just quit or given up. Stephen comes in and gets a leadoff single, and then Duran hits a three-run bomb and we're like, 'We're in this now.' All of a sudden, Ortiz hits a home run and we're one swing away from tying it, and it happened. It was crazy, man." The second blast led to a pitching change, but the new Lexington arm fared no better. Reliever Tad Ratliff served up a game-tying solo shot to right by Maton, the BlueClaws' third straight homer. "I got him 3-2," the 2017 seventh-round pick said. "I knew he had a good slider and a good splitter, and he threw me both of those for a ball. I was expecting he'd come back with something at 3-2 that he knew he could throw for a strike, so luckily I got a fastball up in the zone and was able to hit it." Lakewood had just one dinger in its first 25 posteason innings at the plate before the big ninth capped by Maton's blast. "It's crazy," the shortstop said. "Definitely the best home run I've hit in my life. I couldn't contain my smile around the bases, got back in the dugout and celebrated with all my teammates. Pretty good feeling." Playing without the Minor Leagues' regular-season extra-innings rule that placed a runner at second base to start each frame beyond the ninth, Lakewood and Lexington traded scoreless frames in the 10th. The Legends got a one-out double to center by Manny Olloque, but left him in scoring position. In the 11th, Lakewood broke through. Duran singled to center and Ortiz sacrificed him to second. After Maton moved Duran to third with a groundout to short, the backstop scored the go-ahead run on Stokes' single to center. Zach Warren pitched around a two-out walk to MJ Melendez in the 11th to pick up the save. 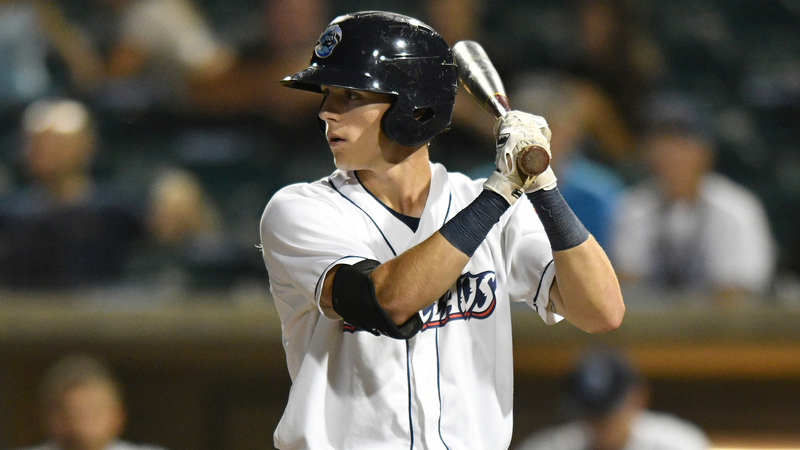 The victory marked the BlueClaws' 10th in a game in which they trailed in the seventh inning or later since July 23rd. "I think we just believe in each other," Maton said. "We've been playing with each other a long time. It's just basically that. The camaraderie is really, really good in the dugout and everybody just believes in everybody. There's really no quit in the team." Game 2 is set for 7:05 p.m. ET on Tuesday in Lexington before the series shifts back to Lakewood for Game 3 on Thursday. "It's big," Maton said of the series-opening win. "Both of these teams have really big arms coming up. They've got [No. 4 Royals prospect Jackson Kowar] going tomorrow. We've got [No. 17 Phillies prospect Kyle Young] going. Any win is big in this series, and it feels good to get the first one."